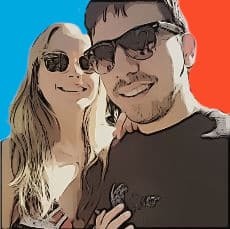 Hey there I’m Mike! For years I’ve been tinkering with engines and squeezing out that extra bit of horsepower… But what’s it all that power worth if your ride looks like a bucket of rust!? You want to be able to cruise the drag in your 1970 Chevy Chevelle SS and see the sun glisten off the ruby red paint. And to do that, you’re gonna want to take car of your paint and exterior. You Need a Complete Car Wax Kit? Check this out…. Why did we write the Meguiar’s Complete Car Care Kit Review? Because we at ScannerAnswers want you be take pride in your ride for years to come, Matt wrote up a quick guide on waxing your car (or truck) and the best car wax to preserve paint color. 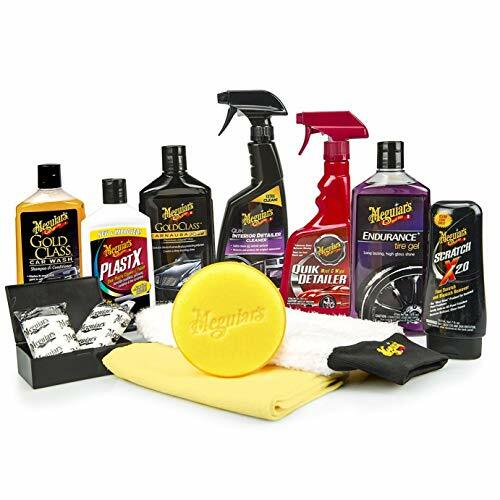 One of the featured products that we got a lot of questions on was the Meguiar’s Complete Car Care Kit. We figured that rather than responding to all 56 emails, we’d right a quick, hands-on review on the Meguiar’s Complete Car Care Kit. I personally like washing and waxing my cars. I usually wax or polish my cars during the weekends. This gives me more than enough time to inspect the interior and exterior so I can do something to correct and prevent further damage. Scratches, stains, and swirl marks on the paint are more evident on darker colored cars, and I used to have 2 black cars sitting in my driveway. Black or dark paint requires a bit more care and attention since using the wrong cleaning and washing techniques will actually do more harm than good in terms of clarity, depth of color, and overall shine. The above reasons are why I was looking forward to writing this Meguiar’s Complete Car Care Kit review. I am a big fan of the Meguiar’s brand and I prefer using Meguiar’s car care products over other brands. Because their wax work very well on my black cars, and they consistently integrate natural carnauba wax in creating their top-of-the-line waxes and polishes. Carnauba is the hardest natural wax in the world. It is also responsible for bringing out the deep and glossy shine of the paint. Believe me, I have tried other waxes and polishes from other brands that contain synthetic Nano ingredients. Some of them work, but I still prefer the professional results that a carnauba-based product can bring. In this Meguiar’s review, I tried to test each and every part of the 12-piece detailing kit to determine if each product works as advertised. This kit contains everything you need to detail the interior and exterior of your vehicle. In fact, this kit is applicable even if you have more than 2 cars in your stable since a single 16 oz. bottle of shampoo or polish is enough to detail 4 or 5 vehicles. I personally like waxing or polishing by hand, but it’s good to know that the products included in this kit (particularly the Gold Class Liquid Wax and the ScratchX 2.0) can be applied and removed using an orbital buffer. COMPLETE CAR KIT: Includes 12 premium products to clean, shine and protect your paint, interior, wheels, bumpers and everything in between. Takes guesswork out of the equation. For this Meguiar’s Complete Car Care Kit Review, I decided to test each product on my 2010 Mazda MX-5 Miata. This used to be my daily driver until a colleague of mine convinced me to transform my bone stock Miata into a more aggressive track day machine. This car is still a work in progress and it just received a fresh coat of Midnight Black urethane paint a couple of months ago. This will serve as the perfect canvass to test the different Meguiar’s products in my arsenal. I washed the car using the Meguiar’s Gold Class Car Wash Shampoo and Conditioner using the supplied microfiber wash mitt. This product works brilliantly since it can effectively remove harmful contaminants from the paint without scratching or marring the surface with swirl marks. Just a capful of this shampoo on a small bucket of water produced a great amount of sudsy foam that it felt like I was washing my car during an Espuma Foam Party in Ibiza. After washing and drying my Miata, I inspected the paint for hard to remove stains and imperfections like tar, asphalt, and deep scratches. I found a couple of asphalt stains near the front fender, so I grabbed the Meguiar’s Clay Bar and the Quik Detailer spray. The stain was gone in less than 20 seconds. The trick is to spray a bit of Quik Detailer to the affected area and use the clay bar to gently rub off the stain from the paint. A true car enthusiast knows the proper steps to washing and detailing a car, which is wash-prep-polish-wax. After removing the stains on my Miata using the clay bar, it was now time to apply wax. Hold on! But polish should be next after prepping the surface, right? Yes, you’re absolutely right. This is the perfect opportunity to reveal the glaring omission from the Meguiar’s Complete Car Care Kit. There is no polish included in the kit. I don’t understand why Meguiar’s didn’t include the Ultimate Polish in this supposedly ‘complete’ car care kit. Thankfully, my Miata was sporting a fresh coat of paint so there was no need for intense polishing (there were just a few minor swirl marks on the doors), but I would prefer a proper polish before applying a fresh coat of wax. If you need some proper polish, I use (an recommend) Meguiar’s Ultimate Polish or Liquid Glass LG-100. I was hoping that a light coat of the Meguiar’s Gold Class Liquid Wax would be enough to remove or cover up the swirl marks on the doors of my Miata. The Gold Class is a mixture of pure carnauba wax and synthetic polymers that protect the paint against UV damage while giving it an intense showroom shine. I waxed my Miata using the supplied foam applicator pad and removed the excess using the supplied microfiber towel. The Gold Class Liquid Wax was able to cover the swirl marks and my Miata is now gleaming proudly with joy! I didn’t use the ScratchX 2.0 since there were no deep scratches or oxidation on my paint, and neither did I use the PlastX on my headlights… so I cannot comment on how they would work. I’ll give them to my buddy Donny because his 2003 Dodge Caravan has been needing a headlight and wheel/rim restoration. Since my MX-5 is a convertible, the interior is prone to accumulate an assortment of dirt and stains. I used a separate microfiber towel to wipe away the dirt and dust from the dash, console, door sidings, and the seats. I grabbed the Meguiar’s Quik Interior Detailer and sprayed a liberal amount on all hard interior surfaces before wiping the excess with a clean microfiber towel. The results were amazing since the plastic surfaces looked revitalized without the feeling greasy or oily to the touch. My only gripe when reviewing the Meguiar’s Complete Car Care Kit is the absence of a proper polish. For that, I’m deducting a star from this complete kit… because it’s not complete. Nitpicking aside, this Meguiar’s wax kit is great value considering you get a lot of cleaning products and accessories for the price. Just make sure you have an extra pair of applicator pads and microfiber towels before proceeding to detail your car using this kit. Best Portable Tire Inflators of 2019 – Should You Buy One?